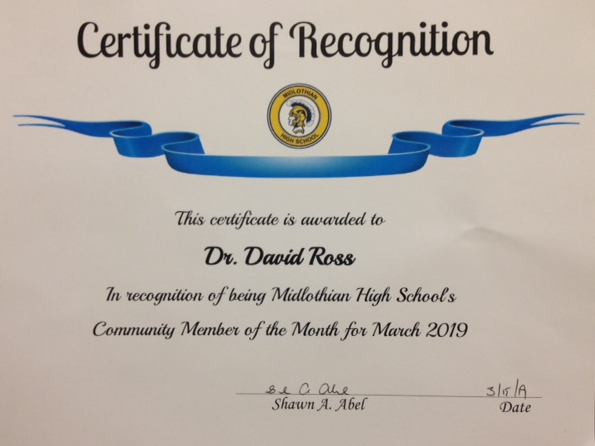 03/15/19: Dr. Ross was recognized as Midlothian High School’s Community Member of the Month. 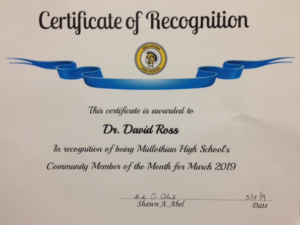 03/08/19: Dr. Ross was invited to speak at Randolph-Macon College. Dr. Ross was recently invited to Randolph-Macon College by Dr. Bardi to be a guest lecturer to his Behavioral Neuroscience seminar. He gave a presentation on his experiences in his specific career field and what led him to it – as well as some of our recent research on MRI brain volume measurement in TBI (Traumatic Brain Injuries). 02/25/19: Dr. Ross gave a talk entitled ‘Patients with chronic mild or moderate traumatic brain injury have abnormal brain enlargement’ for the Virginia Neuroscience Initiative. Until recent years, most experts thought that brain volume was normal in patients with mild traumatic brain injury (TBI). The development of recent MRI-based technologies, including software programs like NeuroQuant and NeuroGage, have led to a new understanding of this area. In this talk, Dr. Ross reviews his research over the past 8 years, which has found that patients with chronic mild TBI have multiple brain volume abnormalities, including: 1) atrophy; 2) abnormal enlargement (more enlargement than atrophy, surprisingly); 3) abnormal asymmetry; and 4) abnormal longitudinal volume changes. An interesting case report suggests a hypothesis for why there is abnormal brain enlargement. To watch the full Virginia Neuroscience Initiative webinar, click here. “High Correlations between MRI Brain Volume Measurements based on NeuroQuant® and FreeSurfer,” authored by Dr. Ross and colleagues, has been accepted for publication by the journal “Psychiatry Research: Neuroimaging.” Ross, D.E., Ochs, A.L., Tate, D.F., Tokac, U., Seabaugh, J., Abildskov, T.J., et al., in press. High Correlations between MRI Brain Volume Measurements based on NeuroQuant® and FreeSurfer. Psychiatry Research Neuroimaging. 12/07/17: Virginia Biotechnology Association (virginiabio) Highlights Richmond Times-Dispatch Article Featuring Member Dr. Ross’ Use of NeuroGage® to Quantify Impact of Football on the Brain. Dr. Ross was interviewed along with Willie Lanier, NFL Hall of Fame linebacker, whose MRI brain images were analyzed by Dr. Ross using NeuroQuant® and NeuroGage®. 11/02/17: Dr. Ross Works with M1 Imaging to Expand Clinical Use of NeuroQuant® and NeuroGage® in Southeastern Michigan. 08/24/17: Dr. Ross Invited to Speak to 100 Medical Providers at M1 Imaging Center. Dr. Ross has been invited to present “Proving TBI Objectively with MRI Brain Volume Measurement” to the Association of Plaintiff Interstate Trucking Lawyers of America’s 2017 Super Summit in Tampa, Florida on May 20, 2017. Dr. Ross spoke about the use of NeuroQuant® and NeuroGage® in brain injury litigation at the North American Brain Injury Society meeting in New Orleans on March 29, 2017. Dr. Ross spoke again this year at the Advanced Forum on Medical Liability Claims, Coverage & Risk Management in New York on October 28, 2016 about brain injury litigation during the Post-Conference Master Class. On 07/22/16, Dr. Ross served on the committee for the Brain Injury Medicine (“BIM”) board exam to write and review exam questions for the 2016 BIM exam. The exam is given by the American Board of Physical Medicine and Rehabilitation. Dr. Ross was among the first group of physicians to receive board certification in brain injury medicine in 2014. On April 28, 2016, Dr. Ross testified regarding the plaintiff’s NeuroQuant® and NeuroGage® results in a state court case in the Superior Court J.D. of Stamford/Norwalk at Stamford (Connecticut) (Ying An and Victor Chen vs. Luisa F. Hekal). The results were admitted into evidence by Judge Donna Heller. This is the third legal case in which NeuroQuant® was admitted as evidence in court, and the second case in which NeuroGage® was admitted. NeuroQuant® and NeuroGage® have never been excluded from testimony in court. In 2015, by invitation, Dr. Ross began reviewing journal articles for the American Journal of Radiology and Journal of Neurotrauma. These are world-leading journals in the areas of brain imaging and traumatic brain injury. In 09/15, Dr. Ross was once again invited to serve on the committee for the Brain Injury Medicine board exam to write and review exam questions for the 2016 exam given by the American Board of Physical Medicine and Rehabilitation. On 06/12/15, Dr. Ross served on the committee for the Brain Injury Medicine (“BIM”) board exam to write and review exam questions for the 2015 BIM exam. The exam is given by the American Board of Physical Medicine and Rehabilitation. Dr. Ross was among the first group of physicians to receive board certification in brain injury medicine in 2014. I feel fortunate to have found Dr. Ross and the Virginia Institute of Neuropsychiatry in 2004. I had a rare movement disorder which was disabling and disfiguring. It caused me to have severe anxiety. I went to several doctors and had a lot of workup but got no real answers or help with the problem. Dr. Ross was the only doctor who was able to diagnose the movement disorder. He prescribed treatment which helped me manage the problem. Without him, I would have been bedridden and on disability many years ago with little to no quality of life. I still have to attempt to explain the unusual movement disorder to new doctors. Dr. Ross is especially good at understanding both my neurological as well as psychiatric problems. As of February 2015, I still feel fortunate to be one of Dr. Ross’s patients. “I was dreading the 9 hour drive to see Dr. Ross for my initial evaluation, not because of the long trip itself as much as wondering if it would be worth it. But it was well worth the trip. He and his staff spent all day evaluating me. The whole day was centered around me. They kept the overhead lights off all day so it wouldn’t bother my eyes. They understood the problems caused by my brain injury better than any other doctor I had seen. At the end of the day, Dr. Ross gave me his home and cell phone numbers, which is unheard of for a doctor to do. I don’t want to call him unless I really need to, but just having his numbers makes me feel better that I can call him if I need him. After the initial evaluation, my husband finally understood what was wrong with me. I think that saved my marriage. During follow up evaluations, Dr. Ross changes one medication at a time, so he can figure out what causes what. I was relieved to finally find a doctor who would do that. Dr. Ross recently passed his board exam in Brain Injury Medicine, a subspecialty of the American Board of Medical Specialities (http://www.abpn.com/sub_bim.html). The exam was first offered this year. Dr. Ross also is board-certified in general psychiatry and neuropsychiatry. Although the board notified successful examinees individually, they have not yet published a list of the diplomates (that should be forthcoming). But they did report that nationally 327 physicians passed the exam; of these, 274 were previously certified in physiatry (rehab medicine), and 53 were previously certified in neurology or psychiatry (https://www.abpmr.org/candidates/exam_statistics.html). There is 1 physician certified in brain injury medicine for every 17,000 TBI patients in the United States. There is 1 physician dual-certified in brain injury medicine, and psychiatry or neurology, for every 108,000 TBI patients in the United States. In Virginia, if we follow national trends, there are 8 or 9 physicians certified in brain injury medicine. In Virginia, there are around 2 physicians dual-certified in brain injury medicine, and psychiatry or neurology. So we have made a good start, but we have a long way to go. Thank you so very much for all your time and effort. I greatly appreciate it. Words cannot express my appreciation for you and your entire staff. Thank you for your brilliance and incredible competence, tenacity, & compassion. Dr. Ross and colleagues published a paper, “Back to the future: Estimating pre-injury brain volume in patients with traumatic brain injury,” which describes an exciting breakthrough in MRI brain volume assessment. Decades of research have shown that the brain shrinks (atrophies) in patients with traumatic brain injury (TBI). But there have been almost no studies on brain volume before the injury, because no one can predict when the patient will have an accident. Therefore, the holy grail of research on MRI and TBI has been to measure brain volume before the accident and compare it to brain volume after the accident. Dr. Ross and colleagues’ solution to this longstanding problem was to estimate brain volume just before the time of injury. They accomplished this by integrating two previous lines of research. Tate, Bigler and colleagues previously found they could estimate the size of maximal brain volume (which occurs during adolescence) by using intracranial volume measured later in life. Hedman and colleagues used 56 studies of brain volume in normal subjects to graph brain growth/atrophy throughout the lifespan. By integrating the methods of Tate and Hedman, Dr. Ross and colleagues were able to estimate brain volume at any age during the lifespan based on intracranial volume measured later in life. We performed brain MRI scans on 26 patients with mild or moderate TBI, and 20 normal control subjects, and used NeuroQuant® to measure brain volume before and after injury. We found that the patients had rapid atrophy of cerebral white matter and rapid enlargement of lower brain regions. These patterns in brain volume changes may lead to the development of diagnostic tools for mild to moderate TBI. With this cutting edge technique, our patients now are able to better understand the effects of the accident on their brain, and in many cases to obtain additional objective evidence of brain injury. Ross, D. E., A. L. Ochs, M. D. Zannoni and J. M. Seabaugh (2014). “Back to the Future: Estimating Pre-Injury Brain Volume in Patients with Traumatic Brain Injury.” NeuroImage 102: 565-578. In June 2014, Daniella Breder joined VIN as the new Clinical Coordinator. She will be a valuable addition to the clinical and research staff. Welcome, Daniella! A paper entitled “Structural brain abnormalities in patients with inflammatory illness acquired following exposure to water-damaged buildings: a volumetric MRI study using NeuroQuant®,” was accepted for publication. This paper was written by Dr. Ritchie Shoemaker and colleagues and will appear in the journal Neurotoxicology & Teratology. This study compared brain volume of a medical control group to patients with suspected illness from mold exposure. The study found that those with mold-related illness had statistically significant differences in brain volume, namely atrophy of the caudate nucleus and enlargement of the pallidum, left amygdala and right forebrain. These structural brain abnormalities, along with inflammatory markers, suggest a model for structural brain injury in mold-related illness. NeuroQuant® continues to be shown as a useful tool in providing objective evidence of brain injury or disease for those who suffer from neuropsychiatric symptoms. On 06/02/14, Dr. Ross gave a lecture to fourth year VCU psychiatry residents on traumatic brain injury. Neuroquant®, the FDA approved software that measures brain volume and provides objective evidence of brain atrophy from MRI images will now be available in Europe. See the article here. On 05/11/14, Virginia Institute of Neuropsychiatry published a video, NeuroQuant® and Mold-Related Illness. This video describes how NeuroQuant® shows MRI brain volume abnormalities in patients with mold-related illness, providing vindication for patients who report neuropsychiatric symptoms associated with mold exposure. On 05/11/14, Virginia Institute of Neuropsychiatry published a video, NeuroQuant® and Traumatic Brain Injury: Man Vs. Machine Part 2. This video describes the results of our study comparing radiologists vs. NeuroQuant® with respect to the ability to detect brain atrophy (shrinking) or asymmetry in patients with mild or moderate traumatic brain injury. On 04/14/14, Dr. Ross gave a lecture to the VCU psychiatry residents on movement disorders caused by psychiatric medications. Best wishes to Megan DeSmit! On 04/12/14, Megan married Cesare Zannoni. After her honeymoon, she and her husband will be moving to Charlottesville, where she will begin a Master’s in Clinical Nurse Leadership (MSN) program at The University of Virginia. We appreciate her dedication to the clinical care of our patients and her contributions to VIN research and wish her the best of luck in her future endeavors! In February 2014, CorTechs Labs, owner/developer of the NeuroQuant® software, listed VIN as an approved NeuroQuant® center on its redesigned website. Chesterfield Monthly, March 2014 – Jan Seabaugh and Dr. David Ross wrote a letter to the editor commenting on the article “Banging Our Heads.” The letter discusses brain injuries resulting from football or other accidents and how NeuroQuant® can identify brain changes. To read the full text version visit the Chesterfield Monthly. Radiology, June 2013 – The article addressed global and regional brain atrophy after injury. Read more. Williamsburg, Virginia, May 2nd-3rd 2013 – Dr. David Ross was invited to speak about neuropsychiatric evaluations and treatment of patients with traumatic brain injury. For more information visit Rehabilitation of the Adult and Child with Traumatic Brain Injury. Philadelphia, Pennsylvania, March 14th-15th 2013 – Dr. David Ross was invited to speak at the Brain Injury Claims and Litigation conference. Dr. Ross will be discussing various brain imaging techniques including NeuroQuant®. For more information visit The American Conference Institute. Richmond Times Dispatch, December 5th 2012- Dr. David Ross wrote a letter to the editor commenting on the challenges veterans face receiving benefits from the VA medical system. To read the full text version visit Richmond Times Dispatch Letter to the Editor. November 2012– The Virginia Institute of Neuropsychiatry and our collaborators had a paper published in the journal Brain Injury. The study showed the brain volumetric software NeuroQuant® had excellent test-retest reliability and proved to be a valid method for assessing brain volume changes. The study concluded that progressive atrophy may continue years after injury. Read more: Progressive brain atrophy in patients with chronic neuropsychiatric symptoms after mild traumatic brain injury: A preliminary study. Midlothian, Virginia, September 6th 2012 – Virginia Institute of Neuropsychiatry clinical assistant Jan Seabaugh M.A. was promoted to assistant director of the Virginia Institute of Neuropsychiatry. Jan has been a valuable member of our practice since 2009 and will continue to work with our patients in the years to come. Richmond, Virginia, April 20 2012 – Dr. David Ross was an invited guest at the MCV Alumni Carrer Fair hosted for current medical students. The fair was an opportunity for medical students to gain information about a variety of careers options in the medical field. Dr. Ross enjoyed meeting the medical students and sharing his knowledge of Neuropsychiatry. New Orleans, Louisiana, September 14-17 2011 – Dr. David Ross was invited to speak about NeuroQuant, at the 24th Annual NABIS conference which included attorney’s, physicians, and clinicians from around the country. Midlothian, Virginia, March 30th 2010 – The Virginia Institue of Neuropsychiatry moved to its new home on Browns Hill Court in Midlothian, Virginia.